I’m going to ruffle some English teacher feathers with this, but I don’t assign reading logs to my junior high students. Nor do I require my Kindergartener to do the ones that are sent home with him. In fact, I think that reading logs are one of the biggest ways to kill the love of reading in anyone, but especially in kids who are just getting their feet wet as readers and are so impressionable. This isn’t just my isolated opinion though; it’s been researched and shown that reading logs turn kids off to reading rather than make them stronger, more literate students. Reading logs are not the habits of life-long readers, rather the practices of people who “have to get this done”. Reading logs create another chore, another thing on the agenda for kids. A main focus of books like Book Love by Penny Kittle and The Book Whisperer by Donalyn Miller is that we should be creating life-long readers by teaching them the habits of life-long readers. I consider myself a life-long reader since I have been reading for pleasure longer than I can remember. they find time to read because they look forward to it. and they do NOT log how many pages they read each day or summarize what they’ve read each time or create a diorama of a book when they are done. THEY JUST READ. I know a lot of adult who are book lovers and genuine readers and none of them, to my knowledge, keep a reading log. Some may keep lists of what they’ve read (find me on GoodReads! That is where I keep my lists! ), and some are writers and tend to keep a journal of their thoughts, which may include what they read. But none…NONE…have a spreadsheet-style paper they pull out of a folder and record the exact number of minutes, the pages, and a summary each time they read. That would take out all the joy, right? 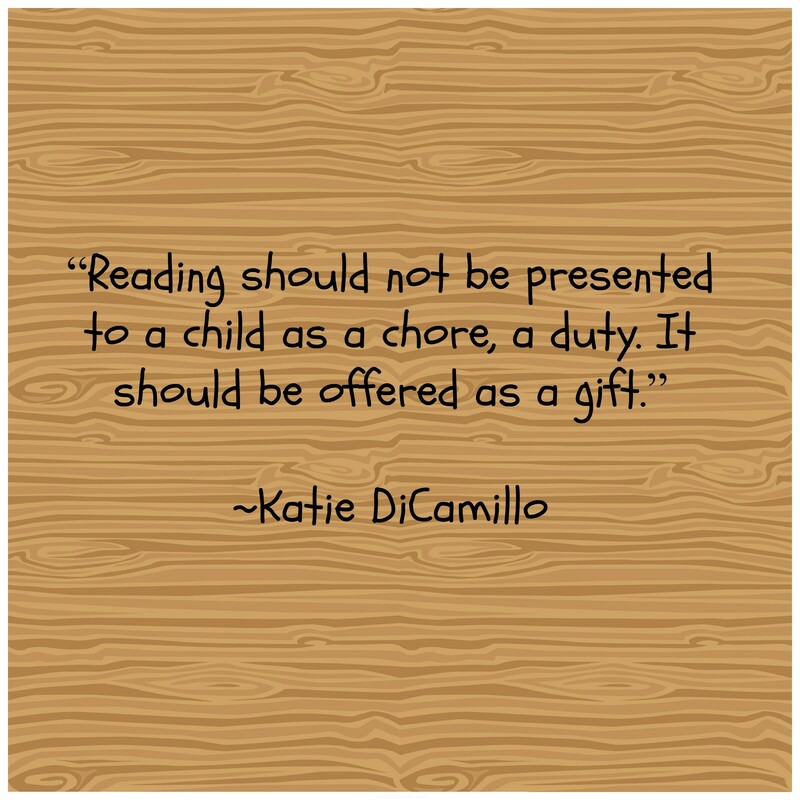 So why do we think having kids do that will equate to them wanting to read? My boys currently LOVE books. We read almost every day. Eddie has reading homework 4 days a week, yes, but he also volunteers to read the bedtime book occasionally. Other nights Cortney or I read the story while the boys snuggle together in the bottom bunk. Since Charlie moved from the nursery to the “Big Boy Room”, he has been introduced to all the non-board books in the house and he can’t get enough! It’s fabulous! Eddie’s teacher also sends home a monthly reading log in calendar form. It’s not required that he do it, but if he “reads for 20 minutes every day” and colors in each day AND has a parent sign it, he can get a personal pan pizza from Pizza Hut. I sign that thing every month. 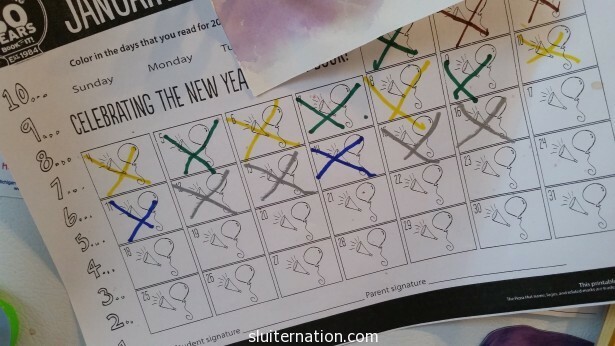 Eddie doesn’t even like Pizza Hut pizza, but he does like checking off each day. Do we read for 20 minutes when we read? Sometimes. Sometimes it’s much more when the boys get on a “book binge”. Some days it’s not at all if we have been going all day and then have plans in the evening that get us home too late to read before bed. But we still cross off every day. I don’t even think Eddie is aware that there is a 20-minute time minimum. I figure the point of the Pizza Hut reading program is to get kids reading and loving it. Eddie already is and does! So why make it a timed chore? My students are all well-accustomed to having to fill out reading logs. When I announced that we would be doing Reader’s Workshop at the beginning of the year, there were many groans and mummers of “reading logs”. When I announced I don’t “do” reading logs there were cheers. One class even gave me a standing ovation. 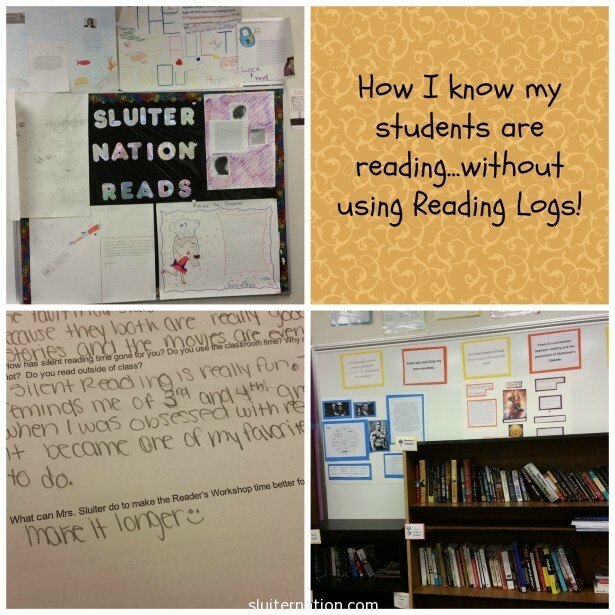 Now that we are halfway through the year, I have asked my students if they miss reading logs, if reading logs were easier than the short assignments and in-front-of-class book talks they have to give now. There were a few that said yes. Those students admitted they could easily lie on reading logs and get their points and never have to actually read. In my class, they have to read. Most students, however, said they don’t miss them at all. They don’t mind the assignments because they are around the book they are reading and not something I am making them read. They also get time in class to read a book of their choice, so journal entries, character maps, and 1-page responses don’t really feel like so hard. They also enjoy talking about their books either to each other or to me. While there are still many who get nervous to get in front of class, the formal Book Talks are the #1 way kids decide what they want to read next. And guess what…they are reading. Without logging every page on a spreadsheet. This is the only spreadsheet they see. It’s passed around the room on a clipboard so I can see what kids are reading. They are not graded on how much they read, but it gives me a starting point for our conferences. What my students are doing is much closer to what I do when I settle in with my book each night on the couch, cup of tea steaming next to me. And after I read, I tend to check social media and there are always a couple threads of friends asking “whatcha reading?” with long conversations about good books and crappy books. As I add my thoughts to these threads, I smile because I am doing exactly what my students are asked to do: read and talk about books. I could kiss you for writing this. This is something I am passionate about. Reading logs absolutely DO destroy the love of reading in school-age children: it happened with mine, at least. Keep leading the way, Katie! As someone who didn’t read a single thing that wasn’t, specifically, assigned between 5th grade and my junior year of college, I love this post. I had to re-find my love of reading, because reading logs – lots of “you must read this” – made reading a chore. This is just another thing I worry about when it’s time for my kids to start grade school. I don’t understand the desire on the teacher’s or administrator’s part to create more paperwork. 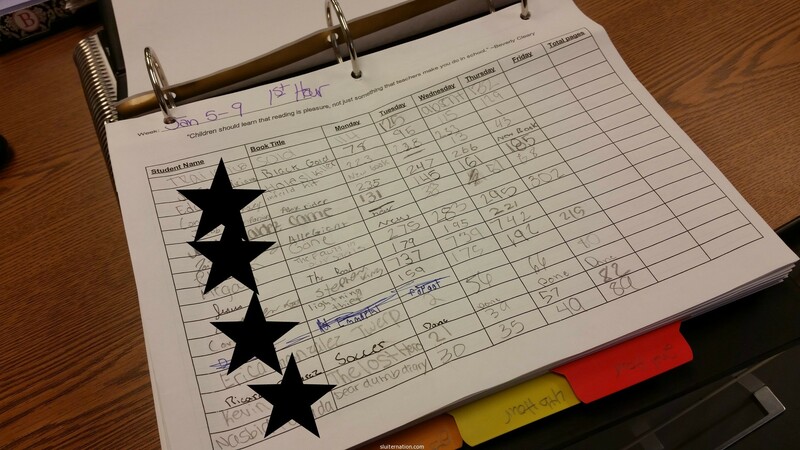 And like you pointed out…filling out a log doesn’t engage the kids in reading. They can lie or they can read the words but not comprehend them and the message behind them. Your practice, of having discussions and written assignments related to their individual reading choices (which is also awesome), is something I wish my teachers had put into place when I was in school. I love this!! I have never done reading logs, either, because it seemed pointless to me. However, I was recently in on a grant that gave me $750 in scholastic books to add to my (non-existent) classroom library. It is part of a Writing Pathways research project, and one aspect of it is book talks. I really want to work them in, but haven’t yet. My focal class, chosen by the project, is my AP class, and we can’t really focus on literature chats on a weekly basis because it is not a literature course. But I REALLY want to try them with my freshmen honors class. I think you have inspired me to give it a go! You know how I feel about this. We’ve talked about it several times. Reading logs are the devil. And AR points are even worse. It does NOTHING to encourage my child or inspire her to read. Love it! I don’t even bother filling out the minutes read on my boys’ reading logs, though they do read every day. I don’t think the time matters and I don’t want them clock-watching. One of my boys completely missed his AR goal for the 9 weeks because he found chapter books he loved and those took him longer to read. I could have told him to pick out shorter, easier books that he could quickly test on, but instead, he read what he loved. And you know what? He showed tremendous growth in reading, more than he’s ever shown. Thankfully, his teacher gets this and was super excited to show me his new reading level and didn’t care about minutes read or AR points. Shell recently posted…Kindergarten Redshirting: Did We Do the Right Thing? I love you, Katie! I would hate for ‘homework’ to kill the love of reading in anyone. Reading should be a pleasure, not a chore. I love this…I’m teaching junior high English as well as a remedial reading lab class. I used to use reading logs, but gave them up when the time became a huge issue with our homework policy. Instead, I do like you do, and when we’re reading an assigned book I give them weekly reading goals and then we have a project/discussion/assignment based around what they read. It works. My reading lab students are enjoying NOt reading at home – instead we do SSR each day, sit in comfy bean bag chairs (or wherever) that the PTA bought, and have ‘guest readers’ come sit and read with us. There is no expectation for pages or number of books, and we make a big deal when someone finishes a book. It seems to be working ! We have the same Pizza Hut incentive, and another to get a free Six Flags ticket. The incentives are great, but still. I don’t push it; I just log what we do naturally. If we skip 3 days, we skip 3 days. You cant force a love of reading. So many people lose their love of reading in the school years. When my oldest was in public they had to get so many AR (accelerated reading) points each 9 weeks. Read a book, take a test (okay, that part helps with comprehension) and each book had a certain amount of points. But kids were just reading to take the test and get the points, not because they liked it. And it was starting to get more boring and “like a chore” as he was getting older. Anyway, I agree with you completely. And that first quote up there pretty much nails it. My middle daughter’s teacher just changed her punishment system. The message came home was that the kids weren’t conforming and she needed a new system. My instinct is to say that perhaps it’s that she has been absent for two weeks and the kids are feeling disconnected. I am so grateful to educators like you who are working with an eye, or heart, more focused to what the kids respond to. I LOVE this and I despise reading logs and AR points are the devil’s work. We are a family of readers but I have seen the evils or required reading logs and points. I confess to bribing my kids to read. Juliet is getting earrings, Gabriel and William are getting small lego sets. I was at my wits’ end because they just weren’t reading! However, now they are more keen to read. It has awakened an appetite in them. I told them they won’t get gifts every time, but I am so happy to see them getting lost in the world of books.